Playaways are the newest addition to the world of audio books. They come fully loaded with your favorite book titles, so there is no downloading required! Just plug your earphones into the universal jack, press play, and enjoy! Playaways are easy to use. The press of a button allows you to navigate chapters, fast forward, rewind, pause, stop, control the volume, and even adjust the voice speed! Playaways are lightweight and can easily fit into your pocket, making them the most portable of all audio book options. So, bring a Playaway along in the car, to the gym, at the beach, or just when you need to relax. 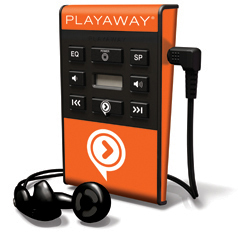 The new Playaway Digital Audio System is a book lover's best friend! The Friends of the Library will be hosting the annual Lake Festival book sale on Friday, July 22nd from 9am to 6pm and Saturday, July 23rd from 9am to 5pm. While enjoying to Celina Lake Festival be sure to stop by the library to browse through the recent donations and withdrawn books. All items will be $1.00 per bag starting at noon on Saturday. The astounding story of a man that said that he would stop the motor of the world—and did. A well-written, honest memoir about a son at a crossroads. He is inspired by a note discovered after his father's death describing his experience running a marathon. The Mercer County District Library loves Facebook. How many of you are on Facebook? How often do you login to your Facebook account? Very nice blog the information is helpful and clear. The kids in the video are cute.